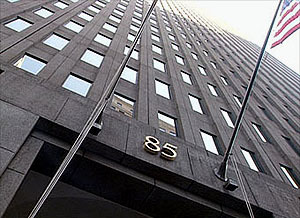 The big Wall Street firm has moved about half of its “proprietary” stock-trading operations — which had made market bets using the firm’s own capital — into its asset management division, where these traders can talk to Goldman clients and then place their market bets….By having the traders work in asset management, where they will take market positions while dealing with clients, Goldman believes it can meet the rule’s mandates, avoid large-scale layoffs and preserve some of the same risk taking that has earned it enormous profits, people close to the firm say. ….People close to Goldman say Goldman will now be weighing other similar moves — taking traders out of the firm’s brokerage division and moving them to other areas of the firm where they can deal with clients and circumvent the rule. That didn’t take long, did it? If this sticks, Goldman and others will essentially be completely unaffected by this new regulation. Sadly, I suspect this is going to end up being true of much of the rest of the bill too. It was worth passing, but only barely. That’s true, but think of this in a different way. Prior to 2008, what kinds of things had been on the lefty wish list? What made our hearts sing? A temporary tax cut and a one-time investment in infrastructure and energy projects? Nope. Bailing out General Motors? Nope. Financial industry reform? Nope. Before 2008, Wall Street reform was barely even on anyone’s radar. It’s purely a reaction to a crisis, not the culmination of a long campaign by populist liberals — and in any case the final result was watery enough that it’s highly unlikely to change Wall Street in any serious way. So that leaves healthcare reform. And watered down or not, that really is a big deal. But among big ticket items on the lefty wish list, that’s it. That’s all we got. And I hardly have to tell you that not every lefty is as enthusiastic about its final form as I am. So in terms of setting liberal hearts aflutter, there’s basically been just one thing — and not much hope of getting anything more for the rest of Obama’s term. And to tot up against that, we’ve had an almost complete acquiescence to the Bush/Cheney vision of national security; an escalation of the war in Afghanistan; the reappointment of Ben Bernanke; a couple of very moderate Supreme Court picks; an obvious unwillingness to back a serious energy bill; and indefensibly slow progress in naming new appointments. All of these things can be justified individually, but if you put ’em together and weigh them against a single major piece of liberal legislation you don’t get a very pretty picture. And that’s the picture a lot of liberals are seeing.